Get FREE high-speed Internet access at this Residence Inn. 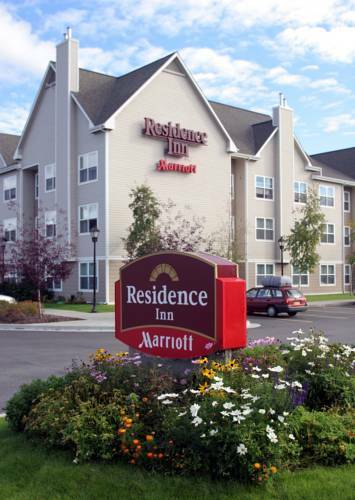 At the Residence Inn Anchorage Midtown, we offer spacious studios, one- and two-bedroom suites with generous work space and a data port, internet access and a direct phone line. There is also complimentary guest receptions Monday through Wednesday, a meeting room and business center, and complimentary shuttle service to Ted Stevens International Airport. Other features include a complimentary breakfast buffet, heated swimming pool, whirlpool, exercise room, complimentary newspaper, iron and ironing board in all suites, cable TV with in-room movies, complimentary grocery shopping services, guest laundry and valet service, and lastly, a daily housekeeping service. A statue of Balto, media darling sled dog hero of the 1925 diphtheria epidemic, vies for accolades with a tiny train.